A trip to Hawaii is an unforgettable experience for those who make it beyond the beach. But with so little time and so many islands to choose from, planning your Hawaiian vacation can a challenging task. I spent four months in Hawaii, hopping across the major islands on a quest to find the best spots. 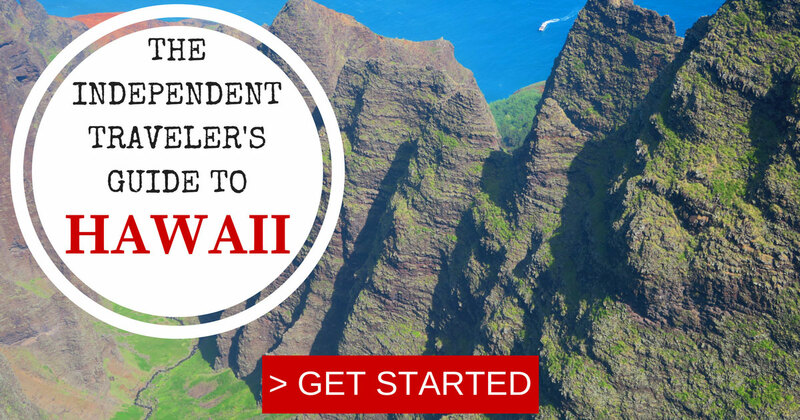 In this post, I’ll share with you a sample itinerary for spending 2 weeks in Hawaii. This itinerary is designed to gradually work up the excitement levels, eventually reaching a climax in the final stop. Don’t worry, you’ll have enough beach time while not missing out on the top highlights that each island has to offer. Let’s get started! Start your Hawaiian adventure in Oahu, the main international gateway to the island chain and home to roughly 70% of the state’s population. Though often overlooked by visitors in transit to the more “rugged” islands (which we’ll soon head to), I was pleasantly surprised on my visit despite “warnings” from friends and residents of other islands that Oahu is nothing more than a “concrete jungle”. 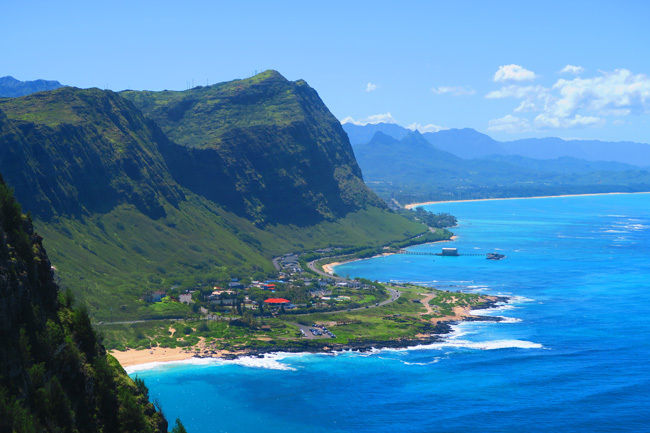 If it weren’t for its relatively large population, Oahu may possibly be the most beautiful island in Hawaii. 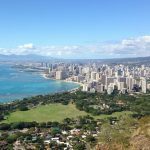 I recommend staying in the Honolulu area – Waikiki for the action or Manoa for a quieter stay – or outside Honolulu by the beach in Kailua. 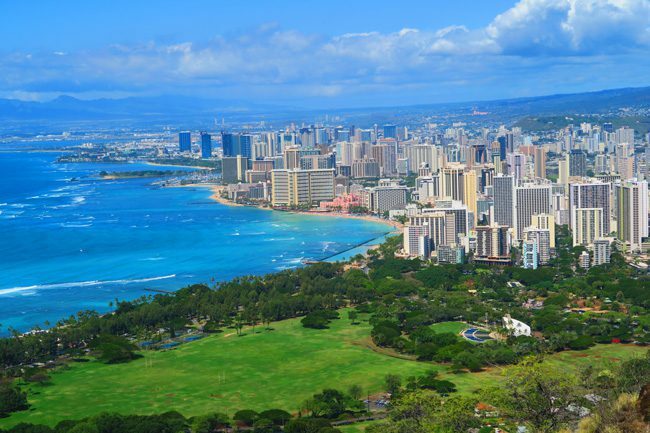 >> Here’s a link to a complete list of Honolulu accommodations which you can book online. 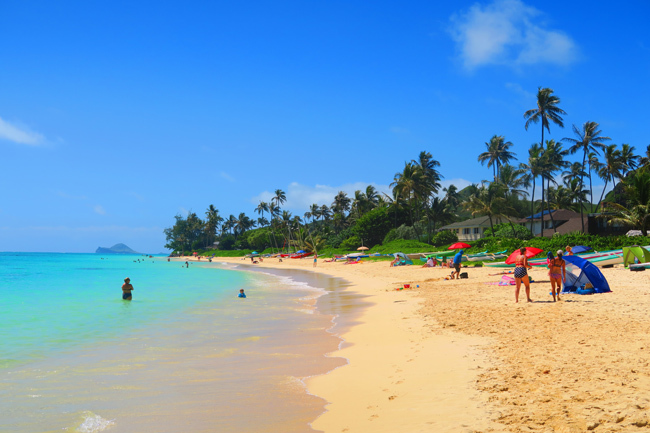 Here’s a complete Oahu sample itinerary, where you can pick and choose what works for you. 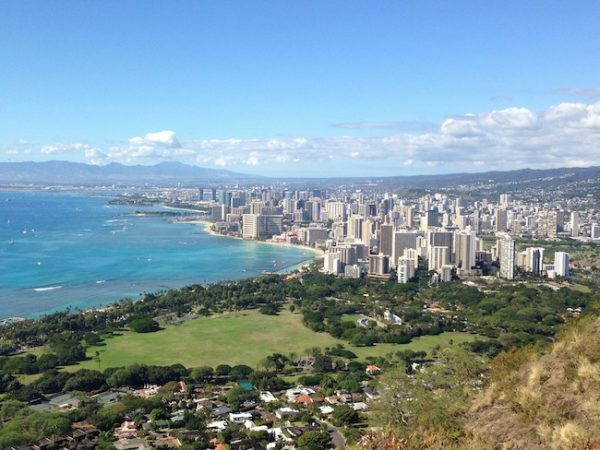 For a quick look at the island’s best spots, check out the top things to do in Oahu. For the second part of your 2 weeks in Hawaii itinerary, choose between the islands of Molokai and Maui. Though separated by just a few miles of water, the two could not be any different. 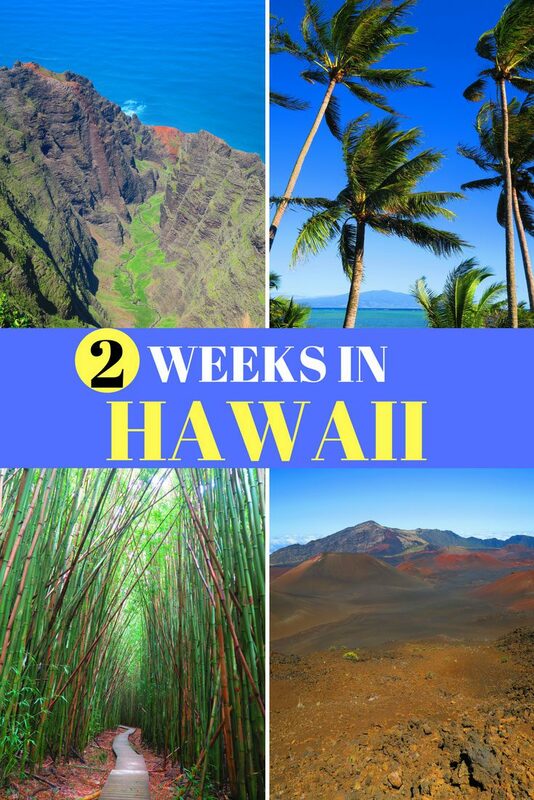 Pro tip: if you really want to maximize the number of islands you’ll be visiting during your 2 weeks in Hawaii, you can dedicate three days to both Molokai and Maui, followed by three days on the Big Island and Kauai. It is a bit of a rush and you will not have much time to relax, but you will be able to see all the top highlights. I recommend staying in and around Kaunakakai which allows for easy access to all corners of the island. For an off-the-grid stay, the west coast is for you! >> Here’s a link to a complete list of Molokai accommodations which you can book online. Spend your 4 days in Molokai exploring the pristine west coast beaches and be sure to stick around for the sunset, drive the scenic coastal road from Kaunakakai to Halawa Valley where you’ll hike with a local guide to spectacular waterfalls before chilling on the beach, and if you have a 4WD, head to the forest preserve for sensational views from the PepeOpae Trail. 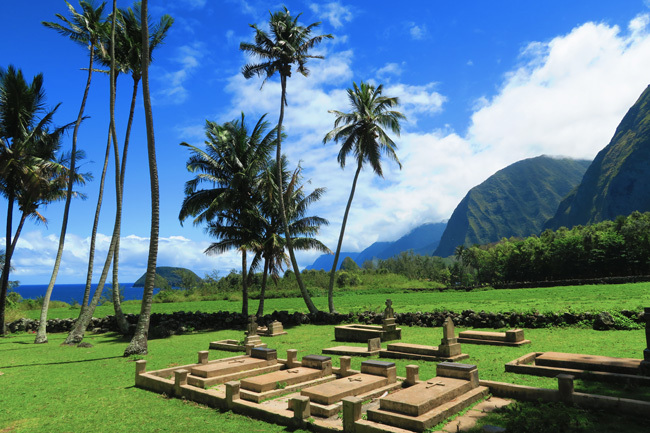 But without a doubt, Molokai’s top adventure is the visit to the former leper colony in the remote Kalaupapa Peninsula. Here, you’ll learn a chapter in modern history that you were likely not aware of and be treated to breathtaking views of the tallest sea cliffs in the world! 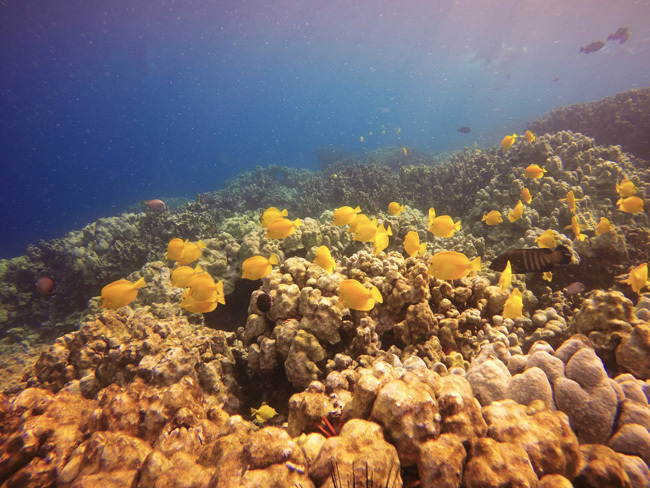 Here’s a complete Molokai sample itinerary, where you can pick and choose what works for you. For a quick look at the best spots, check out the top things to do in Molokai. One of the most famous islands in the world, Maui rides its reputation as a paradise island like a pro surfer and has transformed its agriculture-based economy to a multi-billion dollar tourism factory. 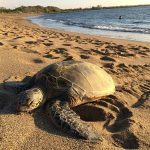 Though “paradise” is not the perfect way to describe one of the more overdeveloped and busier of the Hawaiian Islands, Maui certainly does reward its active visitors and strikes a good balance between beach and nature. 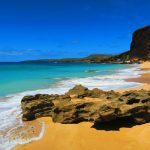 If you’re seeking to stay close to the best swimming beaches, I recommend basing yourself either in the south coast of East Maui or in the Kalapana resort area of West Maui. For a quieter stay, look for Northshore or Central Valley spots. >> Here’s a link to a complete list of Maui accommodations which you can book online. Spend your 4 days in Maui in a fine balancing act between Maui’s best beaches and active sightseeing. Don’t miss the road to Hana – one of the best scenic drives in Hawaii, where you’ll cross 54 one-lane bridges and nearly as many waterfalls. 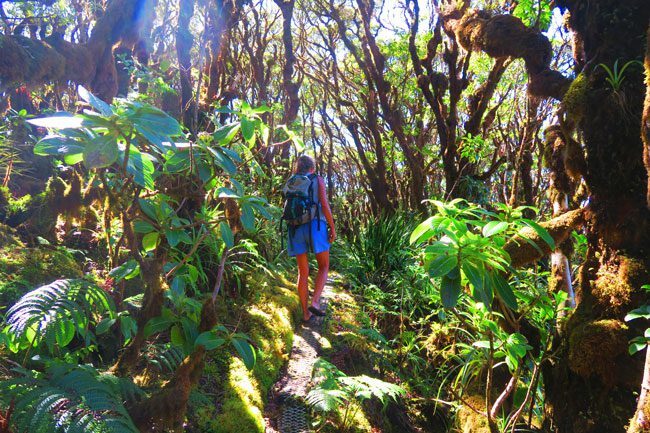 Along the way, hike in a giant bamboo forest to a towering waterfall, make landfall on black and red sand beaches and go for a dip in natural swimming pools fed by waterfalls. 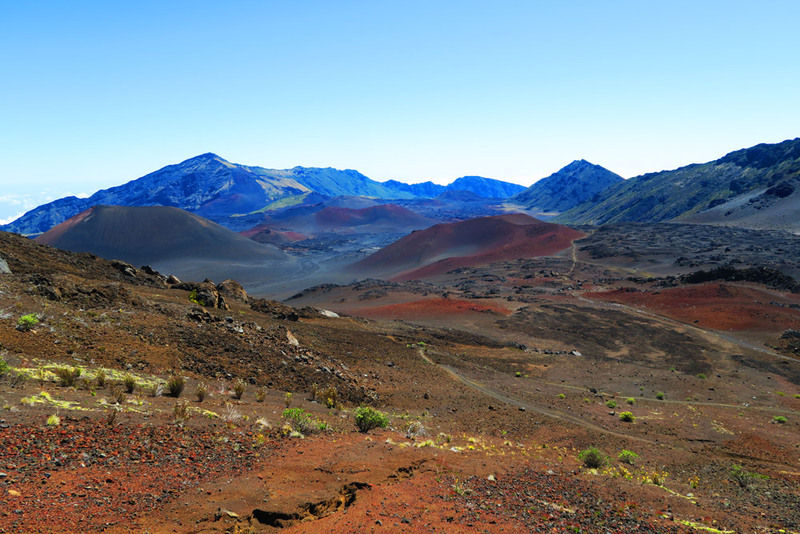 Another “must-do” activity in Maui is the drive to the summit of the Haleakala Volcano. From this windswept spot, watch how this giant shield volcano creates Maui’s bizarre weather and even hike down to its Mars-like crater. 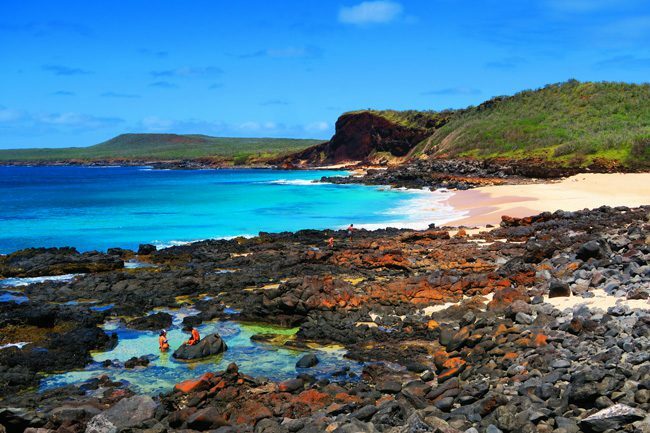 If wetting your feet at the beach isn’t enough, hop on a boat and snorkel or scuba dive in the Molokini Crater – just be sure to catch an early departure to beat the crowds. Here’s a complete Maui sample itinerary, where you can pick and choose what works for you. 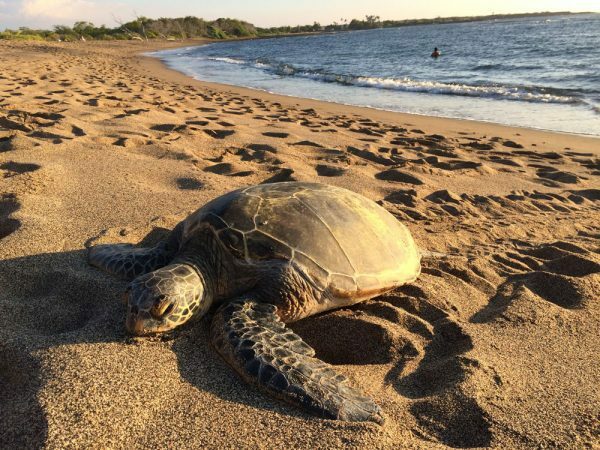 For a quick look at the island’s best spots, check out the top things to do in Maui. Larger than the rest of the Hawaiian Islands put together, they don’t call the Island of Hawaii “The Big Island” for nothing. It is by far the most diverse destination in the archipelago, an island where you could theoretically ski, get soaked by torrential rain, and work on your tan at the beach – all in the same day. The Big Island has something for everyone and it’s usually served in a low key and unpretentious manner. Though not a must, I do recommend splitting your time evenly between the sunny Kona Coast on the west side of the island and the tropical (and obviously wetter) Hilo side on the east coast. The reasons for that are to reduce driving times and to ensure you have enough time to adequately enjoy the highlights that each side has to offer. >> Here’s a link to a complete list of Big Island accommodations which you can book online. Spend your first day on the island in one (or two or three) of the Big Island’s best beaches on the Kona Coast. Here, you can swim, ride waves, meet sea turtles, and snorkel in two of the best spots in Hawaii. On your second day, hit the road and head north to the Kohala Region. 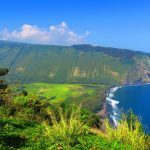 Visit historical small towns that seem to be stuck in the 1950’s and hike down to the majestic Waipio Valley. On your third day, slice through the middle of the island on Saddle Road and explore the lush east coast along with Hilo – the beating heart of the Big Island. 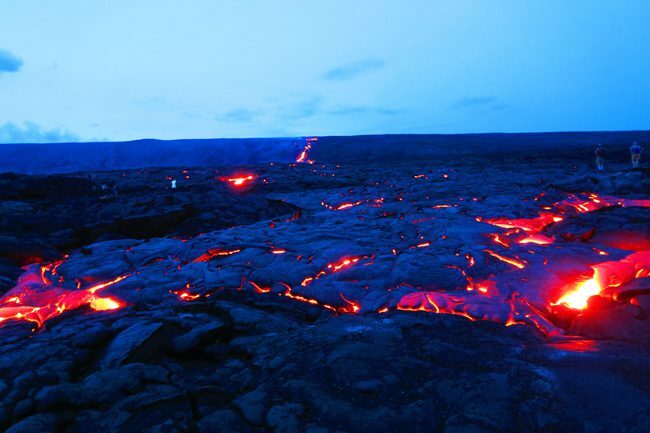 If there’s enough time, you can even hike or cycle to the current lava flow in Kalapana – an experience you’ll never forget. Spend your last day in Hawaii Volcanoes National Park getting to know the Kilauea Volcano from up close via hikes, scenic drives, lava tubes and more. Wrap things up at the Jaggar Museum as the sun sets and watch the night sky illuminated by lava erupting from the birthplace of the fire goddess Pele! Here’s a complete Big Island sample itinerary, where you can pick and choose what works for you. 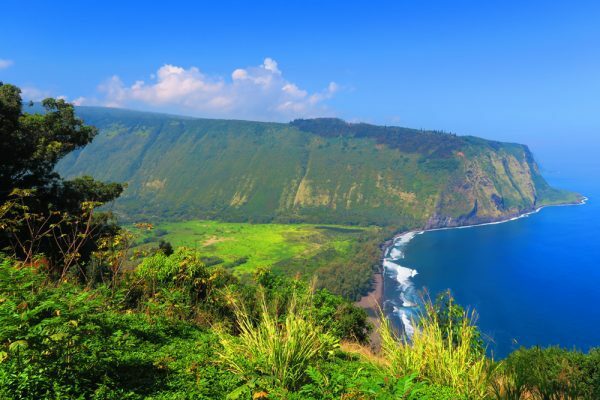 For a look at top spots, check out the top things to do on the Big Island. Your 2 weeks in Hawaii is about to reach its climax in the final leg. The “Garden Isle” is blessed with immense natural beauty, that even a quick trip to the gas station is a scenic drive. It is the oldest of the major Hawaiian islands, home to some of the wettest spots on the planet and to the most “hippies” you’ll find in the state. 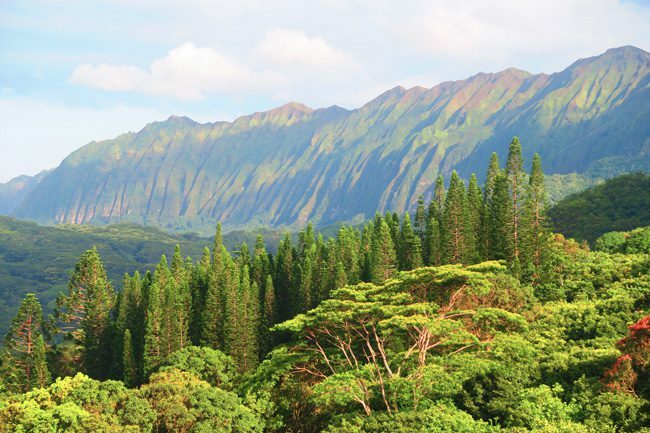 Given this geological head start, Mother Nature has had millennia to erode Kauai’s volcanic peaks and carve its lush interior to absolute works of art. 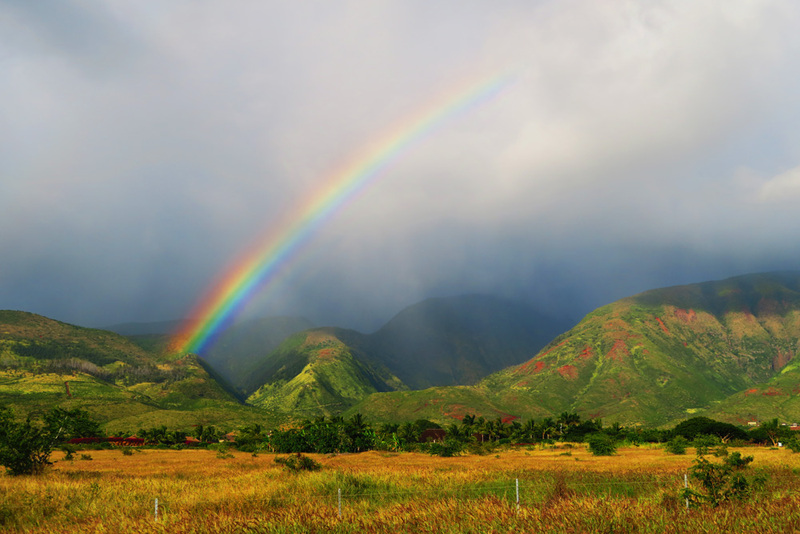 You come to Kauai for the outdoors and to get as close as possible to experiencing that “paradise” of a feeling. Like in the case of the Big Island, I recommend splitting your time in Kauai, this time between north and south – though this is not a must if you don’t mind long drives. On the tropical north coast, stay in the vacation community of Princeville or in the paradise-setting of Hanalei. Down south, where it’s usually sunny, Poipu is a top choice for families and resort-goers, while Hanapepe is more for laid-back. >> Here’s a link to a complete list of Kauai accommodations which you can book online. 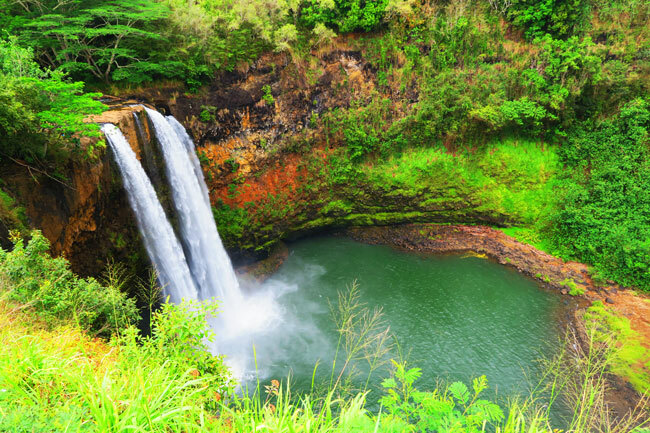 Spend the first of your 4 days in Kauai exploring the area from Lihue to Hanapepe. 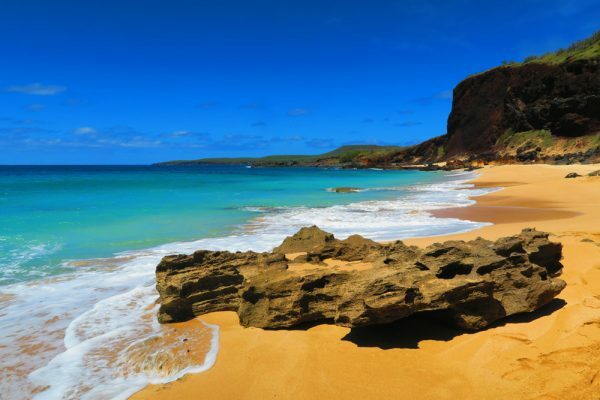 Pause for a picnic lunch in Poipu Beach and pick up the coastal Maha’ulepu Heritage Trail. For awesome sunset views, head to either Salt Pond Park on the Hanapepe side or to Menehune Fishpond Overlook on the Lihue side. 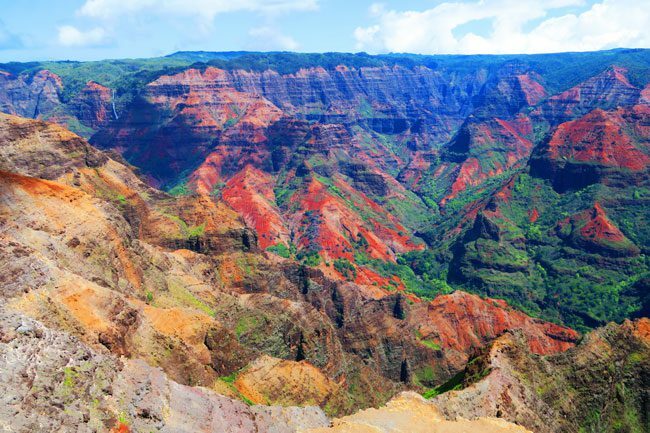 On day two, get an early start and drive the scenic Waimea Canyon Drive. 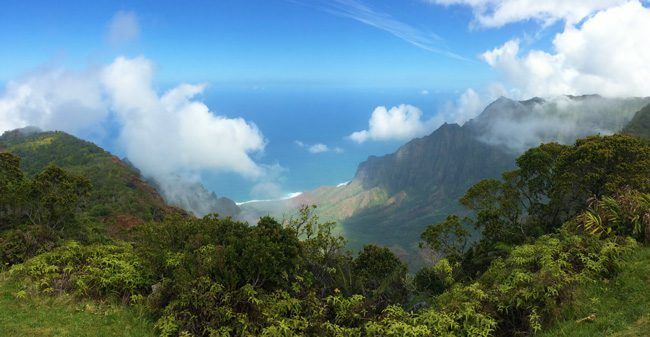 Admire the “Grand Canyon of the Pacific” from dozens of lookouts and continue to Koke’e State Park where you can pick up a few hiking trails and enjoy spectacular views of the Na Pali Coastline. In the evening, head to Luau Kalamaku for the best Polynesian dance show in Kauai. On day three, head up the coast to Hanalei Bay. 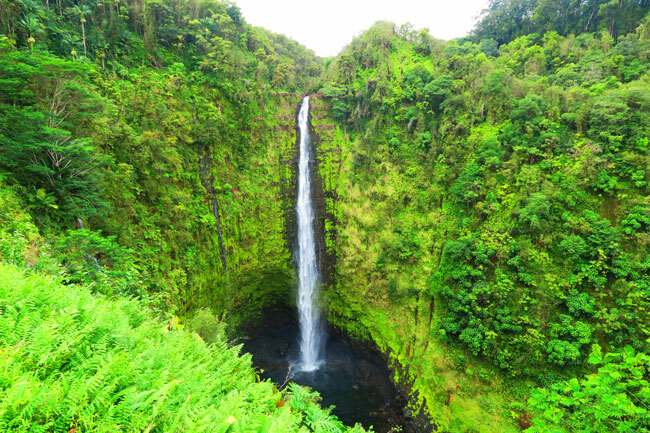 En route, gaze at Wailua Falls from its lookout, visit the bird sanctuary at the Kilauea Lighthouse, and spend the rest of your day in Hanalei and its gorgeous bay. 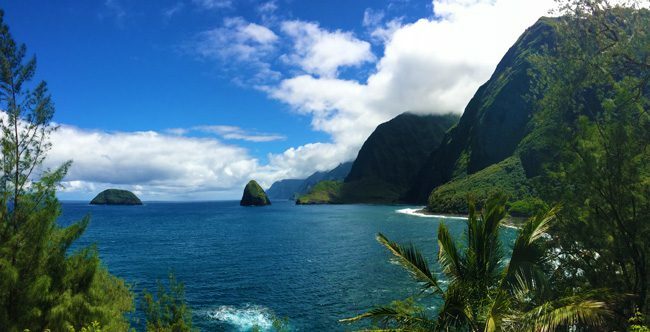 On day four, drive early in the morning to Ke’e Beach and hike part of the Kalalau Trail – one of the best hikes in Hawaii. 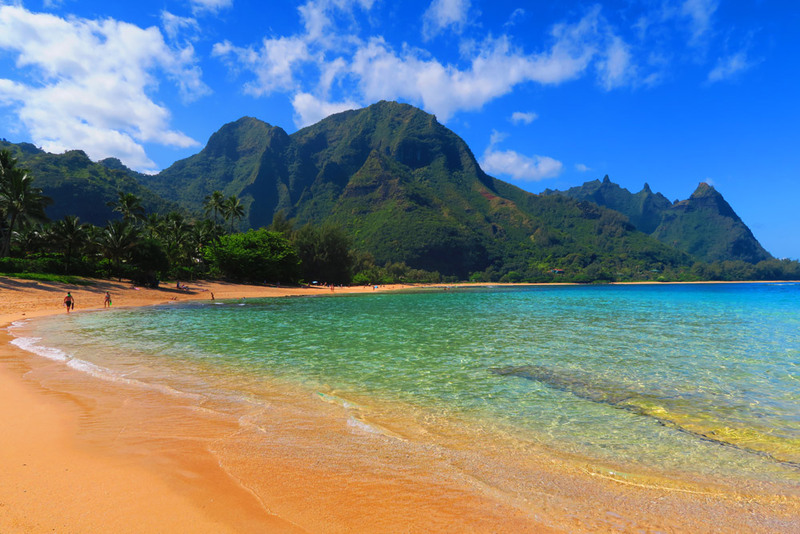 After the strenuous effort, get some beach and snorkel time in Tunnels Beach – the best beach in Kauai! 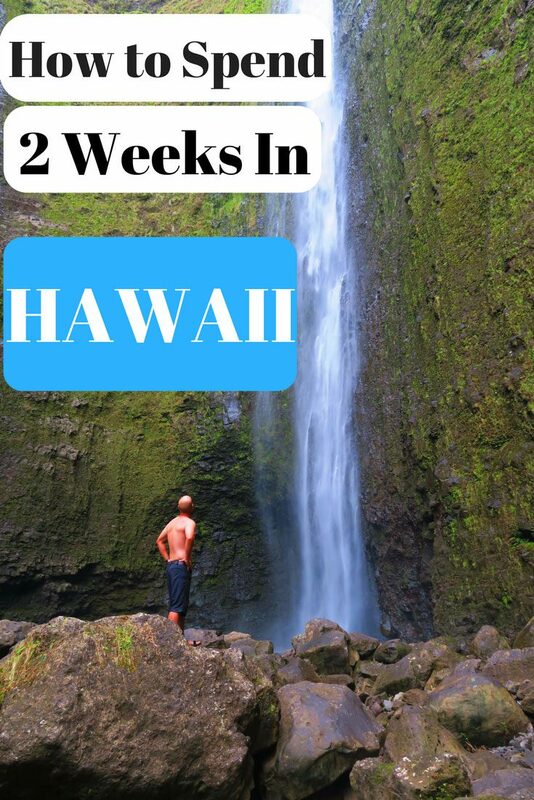 I hope you’ve found this 2 weeks in Hawaii sample itinerary helpful in building your own Hawaiian adventure. Want to see more of Hawaii? Guides to the best beaches, scenic drives and plenty more are all waiting for you in the Hawaii Travel Guide collection. Aloha! Thank you for taking the time to create this wonderful/perfect itinerary. You’re the best tour guide. Highly recommend to this anyone going there for 2 weeks. Trust me you will save a lot of money in comparison to getting a formal tour, if you read through and plan head like I did. I backpacked in Hawaii recently (05/2018) with a few friends and visited Oahu, Maui, Big Island and Kaui. This itinerary allowed me to plan my flights and accommodation schedule for each island, well in advance. I was traveling on a budget and saved a lot money by camping, staying in hostels and also renting a car to visit places mentioned in your itinerary. Thanks to you, we not only had a head start on all the best food avenues (ie food trucks and restaurants) but did some amazing hikes and explored the best sites first hand. Mahalo (thank you) for the feedback Varun. Sounds like you thoroughly explored Hawaii! Hawaii is a wonderful place.this is really a peaceful place. I love that place so much. thanks for sharing this post.